I want to welcome everyone who recently joined So Lonely in Gorgeous, hi guys :D isn't Bloghop great!? It really means a lot to me that you've taken an interest in my blog and I'm looking forward to future friendships. 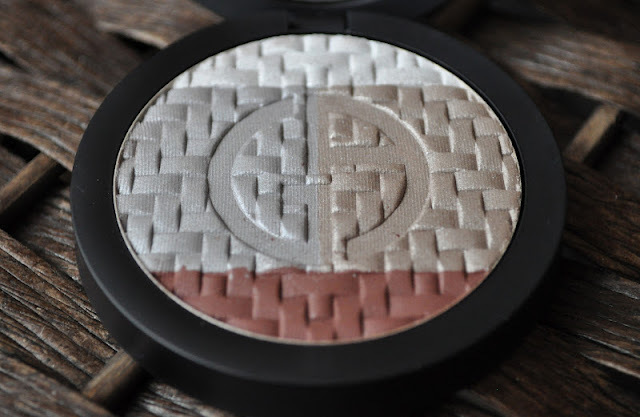 Yesterday, as I was rummaging through my eye shadow drawers(getting ready to go out), I came upon the Giorgio Armani Jacquard Grey Eyes Palette. I purchased this palette last year, but I never got around to using it. So, in keeping with my New Year's Resolution of using everything in my collection, I decided use my Giorgio Armani Jacquard Grey Eyes Palette for last nights look. A silvered white with a sparkly pearl finish. A shimmery pale silvered grey lilac. 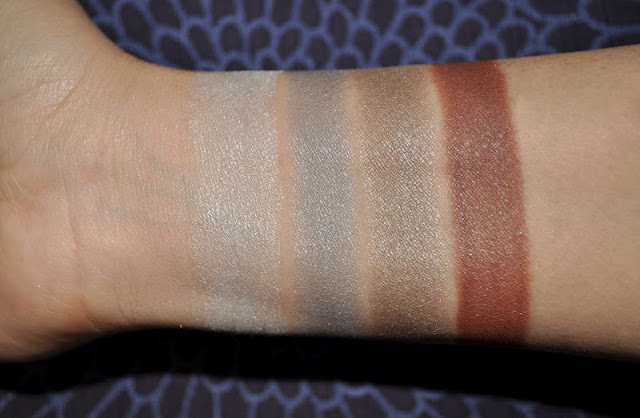 A shimmery sandy taupe with a grayed mauve tinge. A russet brick red with micro silver flecks. Sorry for the slight blur, but these photo's where taken well after 2:00 am. Frankly speaking, I prefer the Jacquard Grey Eyes Palette a bit then the Green Eyes Palette, and...I'm a girl who loves her green and purple shadows...oh, yes I do! To my surprise, the Giorgio Armani Jacquard 2 Palette in Grey Eyes is still available. Odd, since the colors in this palette are AMAZING!!!! The taupe and brick eyeshadows alone are worth getting palette...actually the silvered grey lilac is very pretty too. This palette retails for $59 and is available at: nordstrom.com, giorgioarmanibeauty-usa.com and neimanmarcus.com. 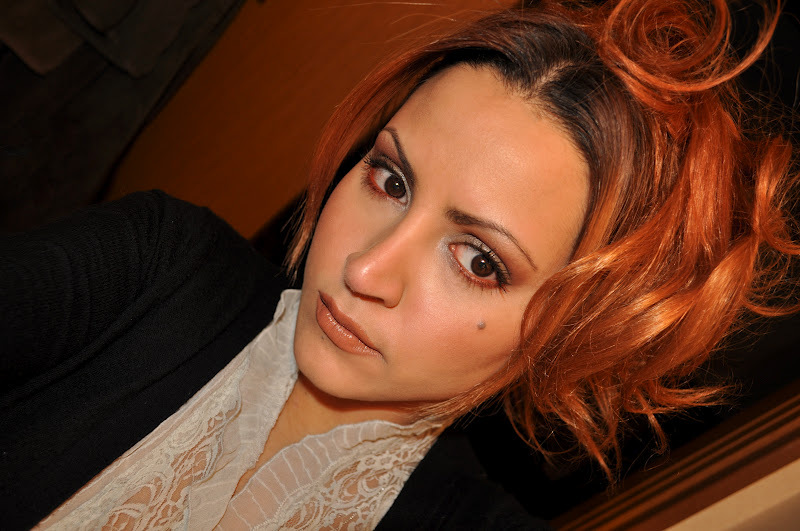 Inglot Face Blush # 33. Giorgio Armani Jacquard Eye Palette #2, the sandy mauve taupe shade all over the lid. Giorgio Armani Jacquard Eye Palette #2, The silvered grey lilac shade in inner corner's of the eyes and the inner half of the lower lash line..
Giorgio Armani Jacquard Eye Palette #2, the silvered white shade used to highlight my brow bone. Giorgio Armani Jacquard Eye Palette #2, the russet brick red shade in the crease and outer half of the lower lash line. Mac Eye Pencil in Coffee used to line the upper lash line. Mac Eye Kohl in Hot Poppy used to line the lower water line. L'Oreal Voluminious Hydrofuge in Black Brown. L'Oreal Voluminious Million Lashes in Black Brown. Thank you Louise, but I think these kind of colors would look lovely on you as well. You may not feel comfortable in them, but that doesn't mean it doesn't look good!! 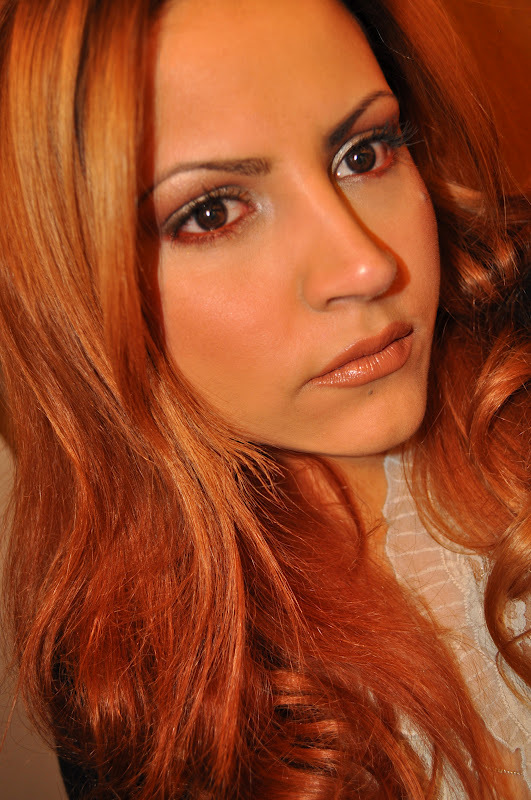 If you have blue eyes, reddish brown shadows will really make them POP. great post!!! now i feel like i need to go buy one of these shadows!!! found you thru blog-hop and now am following you! I didn't know they had a makeup line. The shadow looks really pretty. I agree with Louise, the shadow really does look great on you. Thank you for the compliment ;) You have to try their shadows, nothing but love! This is such a gorgeous shimmery look! The color, hues and shimmer looks so great on your complexion :D I love your blog title, "So Lonely in Gorgeous!!" I love it!!! Would love to follow eachother!?! Thank you so so much Sooji :) It's always great to hear feedback on my blog :DD on my way to follow you now! !